Join Jonathan Webster-Smith, Head of the Multi Asset Team, and Carlos Moreno and Thomas Brown, co-fund managers of the LF Miton European Opportunities Fund as they examine opportunities and risks for European equities. In this webinar we discuss the Monetary Illusion, a term made famous by John Maynard Keynes which describes the tendency of investors to fixate on higher nominal returns rather than focus on real returns. Kamil Dimmich from North of South Capital LLP, Co-manager of Pacific Asset Management EM All Cap Strategy will discuss why this is particularly true in some emerging markets where local currency bonds can have huge coupons but inflation makes that number incomparable with a developed market bond such as a gilt. In this educational talk we will try to unravel how you can compare rates across countries and continents to ensure you don’t fall foul of this common investor trap. A Responsible Investment Webinar focussing on social bonds from an impact and performance perspective, featuring special guest Columbia Threadneedle. We will discuss the changing landscape of responsible investment, highlighting the innovation that is allowing the construction of multi asset, risk adjusted portfolios that meet both your social and performance needs. For our next investment webinar Edward Park, Deputy Chief Investment Officer, is delighted to welcome Karen Ward, Chief Market Strategist for EMEA at J.P. Morgan Asset Management. - Review some of the key political events that have led us to where we are today. - Discuss what the potential next steps for the Brexit process may be, and look at the key political drivers in determining the outcome. - Consider the market implications for sterling, interest rates, and broader markets. The case for why long-term investors should seek to invest in quality companies with clear secular growth opportunities at a reasonable valuation, and then endeavour to do the hardest part – nothing. 2018 has been a tough year for most asset classes as a broad range of concerns have surfaced to weigh on investor sentiment. Investors hate uncertainty and there has been plenty of that for them to digest. Join us as Charlie Thomas will consider how three related investment drivers of People, Policy and Technological Progress are shaping the landscape for sustainable investment, connecting the dots between a burgeoning global ‘middle class’, the mounting challenge of plastic waste, and a transformation of how we consume energy. The webinar will also look ahead to the looming prospect of far-reaching regulation of sustainable investment and ESG in 2019, drawing conclusions on whether this will help or hinder investors. Robotics, automation & artificial intelligence (RAAI) may be one of the most important investment opportunities of our generation. The multi- decade transition to a world dominated by RAAI technologies is still in its infancy and the ingredients for a major breakthrough are already in place. In this webinar, Edward Park is joined by Richard Lightbound of Robo Global, who will discuss the investment themes that they believe will shape this exciting opportunity. The revolution is happening now! Richard Lightbound has worked for 15+ years within the financial services sector with Wells Fargo and Standard Chartered Bank in senior management positions with responsibility for Institutional and Corporate clients across Europe, MENA and Asia. Richard enjoyed a 7 year break from banking to join an early cloud computing company funded by Warburg Pincus and now part of Infor. Richard launched and managed operations across Asia and Europe. In 2014 Richard joined ROBO Global and in addition to managing daily operations in Europe and Asia, he is responsible for executing business strategy and serves on the Index Committee. Richard is a frequent speaker at Robotics & Automation conferences and events. During his career Richard has lived and worked in Hong Kong, USA, Europe and Sri Lanka. Following a strong 2017, Emerging Market equities have retreated over 15% from their highs in January 2018. But what’s driven this underperformance? And what’s the outlook for earnings over the next year? Featuring guest speakers from Defaqto, Asset Risk Consultants, threesixty and AKG Financial Analytics, the webinar will assist professional advisers and paraplanners with the seven-step approach to DFM due diligence. Rather than de-globalising, we believe the world has entered a new era defined by intangible flows of data and information, based on powerful new digital infrastructure. This is not purely driven by large, western multinational companies, but also allowing small and medium-sized enterprises from emerging markets which are ‘born global’ and to become micro multinationals from day one. Join us as Steve discusses some of the major implications of this convergence between globalisation and digitisation, and how this is creating truly global markets and changing the economics of doing business. He will go on to explain how companies with innovative business models and disruptive technologies are altering the landscape and how they are well suited to adapt and survive in the current environment of escalating trade tensions. Mike Riddell will talk about the macroeconomic risks to global financial markets, and some of the signals that suggest the next recession may be sooner than many people think. The talk will touch on the risks posed by global trade wars, tighter monetary policy, commodity prices and China. • Volatility over the last 10 years has been suppressed by central banks, but if history is any guide, recent monetary policy tightening is a lead indicator of greater asset price volatility and higher risk premia. • Tighter monetary policy contributes to slower real money supply growth, which is also a lead indictor for global economic activity. • Higher commodity prices are a sign of strong current growth, but they also imply weaker future growth. Since the Global Financial Crisis a decade ago, markets have witnessed Growth outperforming Value over an unprecedented period. In this webinar Hugh Sergeant, Chief Investment Officer and manager of the Recovery Strategies at River and Mercantile Asset Management, explains why we now find ourselves in one of the most exciting points of his 30 year investment career. Describing value investing and the value cycle, Hugh will demonstrate how the dispersion between Value and Growth investment styles has now reached such a point that it has created a myriad of opportunities spanning stocks, sectors and geography. Meet the managers: Jonathan Webster-Smith and Frank Atkins talk about the performance, positioning and outlook for the medium risk portfolio. Tessa Lee, Managing Director of MoneyInfo, summarises the Information Commissioners Office’s 12-step checklist on GDPR and how these points will affect professional advisers. Fund Manager, Jon Gumpel and Deputy Fund Manager, Dr Niall O'Connor provides an overview of the Defensive Capital Fund. Fund manager Jon Gumpel will provide an update on the Fund's positioning, his macro view for 2018 and how MiFID II will affect the Fund. MiFID II is nearly upon us. This webinar will aim to cover the key considerations of the forthcoming MiFID II legislation – what they are and how they will affect your business. 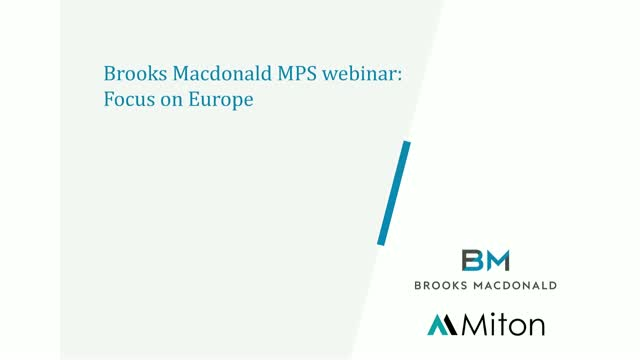 Brooks Macdonald web-conferences are hosted by investment managers and members of the investment committee. They provide valuable insight into world markets, investment and fund strategies and governance.